Rugby players lining out for countries they have only a budding connection with is an all too common feature of the modern game. So much so that World Rugby has increased the residency requirement for internationals from three years to five, beginning in 2021. 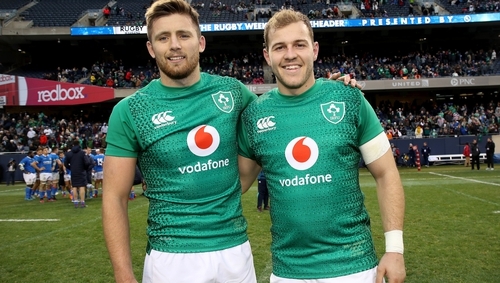 But Joe Schmidt's latest recruit, Ulster back and one-time England U20 Will Addison, insists his family ties have forged a lifelong love for the green jersey, which he wore for the first time in a win for Ireland's second string over Italy in Chicago last weekend. "I’ve got an Irish mother, who instilled in me a real passion for Ireland," Addison (26) told RTÉ Sport. "Brian O’Driscoll was my hero growing up so I always liked to be the different one in school, supporting Ireland when I was younger. "Playing in England (with Sale), I was in a good pathway with them but it was an ambition and I had a chat with Joe over the phone to come over. "To have that kind of contact off probably one of the best coaches in the world lights that fire inside you. Since the moment I’ve spoken to him I’ve had a great experience as well." With Rob Kearney an injury doubt, Addison, who can play at centre, full-back or wing, is in contention for a place in the squad against Argentina at the Aviva Stadium on Saturday. "I was lucky enough to have my Mum and Dad at the game over in Chicago. (An) amazing experience for me to have them there but a home debut at the Aviva, somewhere where I’ve never played before..." said Addison. "I’m extremely excited but I have to focus on what I can control at the moment and that’s in training. "I have to make sure my knowledge is really good come Thursday and Friday and see if that puts me in the frame for the weekend. "There were experienced leaders who stayed at home (last weekend), internationals, Lions, with them fitting back into training with the bulk of the guys from Chicago, it's definitely a very high standard. He was in Cardiff as a fan when Ireland suffered their most recent defeat to their World Cup bogey team in 2015. "I was lucky enough, or unfortunate enough, to be in the stadium on that quarter-final day down in the Millenium Stadium," he said. "I think I had played Saracens or something, so I had a black eye, I remember it quite vividly. "I sat next to Mum and Dad watching the game. Unfortunately, a bad result, but you look at the three years since then and it’s really spurred the team on to greater things and we’ll be looking to put in a good performance this weekend. "I know the heartache that has caused and I think it’s still lodged in the back of most Irish folks’ mind. It’s certainly one of those that we want to act upon when we’re at the Aviva against one of the top teams, we want to perform. With that in mind, you don’t really look beyond that really."